Pretty part located in the Marina of Sitges (Port d'Aiguadolç). Old fishing port that today has one of the most select environments in Barcelona. Surrounded by beaches enjoy a quiet environment of Relax in Beaches and surroundings. You will find a beach 50 meters away from the family atmosphere (Aiguadolc beach) and on the opposite side of the port you will reach a more naturist beach (Balmins beach). At night you will enjoy the best restaurants, lounge-bar and chill-out in the same port. The apartment is located just 20 meters from the Promenade. The apartment is distributed over 2 floors with direct access to a picturesque pedestrian street. On the first floor you find the living room with integrated kitchen. Dining table and 2 convertible futons in 2 single beds. The kitchen is equipped with fridge / freezer, hob, oven, microwave, dishwasher, television, Wifi and air conditioning. Through a spiral staircase you access the upper floor where the master bedroom with a double bed is located and from which you can see the boats anchored in the port through a beautiful window Ojo de Buey. You also have another air conditioning / heating. On the upper floor there is also a bathroom with a large shower. From the bedroom there is access to a balcony where the washing machine and tender area are installed. The apartment includes sheets, blankets, towels and kitchenware. Just worry about your clothes and enjoy. On the ground floor we find a living room with an American kitchen completely equipped (dishwasher, icebox - freezer, stove, vitrocerámica, coffee pot, etc), a table with four chairs and television. Also we find two sofa bed individuals. On the first floor we find a full bathroom with shower, a bedroom with double bed, closet with towels for shower and beach, balcony and laundry zone. Throughout the apartment there is free Wi-Fi connection, air conditioning, heating and safety 24h. There is private parking inside the enclosure of the Port. 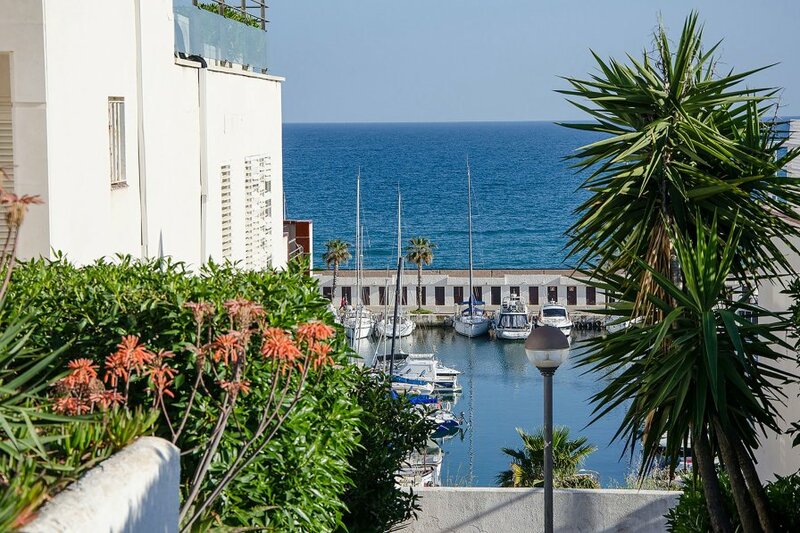 The apartment is placed in one of the best areas of Sitges, the Port of Aiguadolç. It is 500m from the Aiguadolç beach and also 500m from the naturistic Balmins beach. The Port is full of high quality bars and restaurants. The Port is 10 minutes by walk of the center of the village, passing through a way that goes along the coast to enjoy the best views.